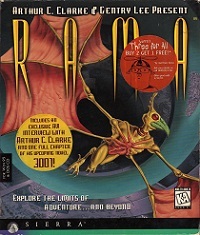 Rama II is a novel by Gentry Lee and Arthur C. Clarke first published in 1989. It recounts humankind's further interaction with the Ramans, first introduced in Rendezvous with Rama. Written primarily by Lee, Rama II has a distinctly different writing style than the original, with a more character driven narrative and a closer-to-contemporary mindset, ambience and human relations than the first novel's more futuristic tones. Rama II is the first novel of the "new" Rama series, as Rendezvous with Rama is not always counted as part of it. The Rama series includes two more sequels: The Garden of Rama and Rama Revealed. The game Rama is largely based on this novel, featuring the same characters. The novel was also included in the Limited Edition box of Rama. Seventy years after the events of Rendezvous with Rama, a second Raman vessel enters the Solar System. Its arrival is expected and an expedition is sent to unlock more of Rama's mysteries, but the crew are unprepared both for what they find and for the conflicts that arise between them. Rama II brings new characters into a new story and is mostly unrelated to the original; largely, it serves to set up its own sequels. The novel ends with three of the twelve astronauts stranded inside Rama as it travels out of the Solar System, Nicole des Jardins, Richard Wakefield and Michael O'Toole.